One of the most gorgeous online shops I have ever seen. I just recently discovered it, and wow! I've been totally swept off my feet, I want every. single. thing they have in their shop! Everything is so elegant, and lovely! And all kind of sweet and adorable accessories! But my favorite is their clothing! The most beautifully simplistic dresses, shirts, and tanks you've ever laid your eyes upon. And today, they're sharing a dress with us--for FREE! 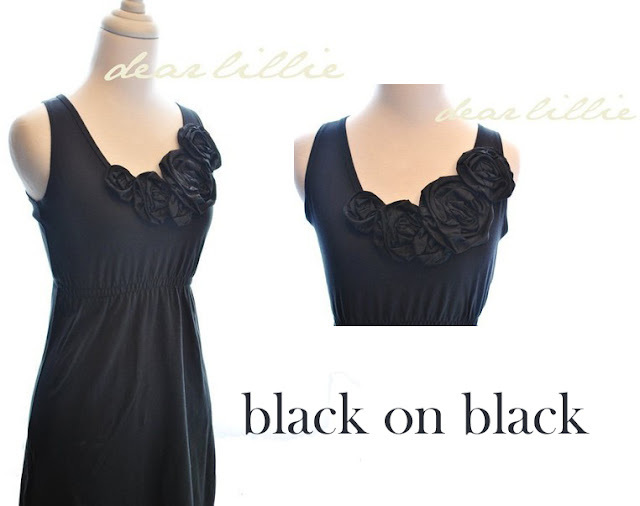 Our lucky winner will get the "Adeliene" dress in their choice of color combination! To enter, simply leave a comment with your email address! Winner will be announced Thu., May 6th! 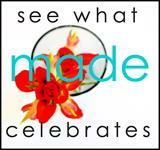 And Blog, which they are having another awesome giveaway on! Be sure to enter! And also check out Made's adorable guest tutorial with V & Co! My name is Kate and those dresses are so beautiful! These dresses are so beautiful! I would LOVE to wear one... or all of them!!! Thanks for the awesome give away!!! They're all so beautiful, but I think the pebble on asphalt is my favorite! I've got my fingers crossed! Hope I win! I would choose black on black! Oh I love these dresses!!! I would take any one of them! I love those dresses and baby headbands. I love the slate on asphalt! Those are beautiful! Love those dresses! How pretty. ooooh the slate on asphalt and black on black are beautiful! Hi there! What an amazing giveaway!! I have NO idea which one I would choose, but it would be great to win one!!! I love those dresses! Perfect for spring, summer.. and even fall and winter! How adorable! 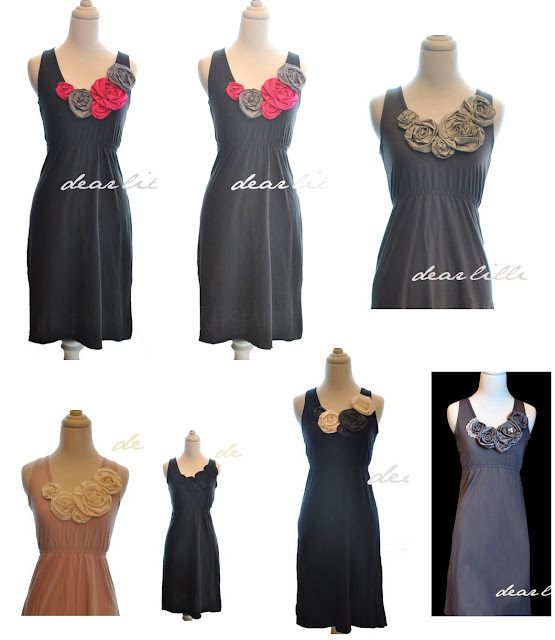 I would love one of these dresses! Beautiful dresses! I don't know what color I would choose either, there are 3 or 4 that I really want. What a great shop! I am so coveting those dresses! So beautiful!!! I would love to win one. WOW! I sooo love Dear Lily! The dresses are so fab!! Would love to win. Oh my, those are so lovely!!!! I think I like the Ivory on Muted pink the most! What a perfect day to evening dress! Thanks for the giveaway! This would be adorable on my daughter to wear for High School Graduation Services! Oh please, oh please! Such a simple, but classy look! I love it. Those dresses are perfect! I hope I win! So adorable, I love it all!!! No sleeves!!! Wish it was modest. Beautiful! I love all of their items! I want one of those beautiful dresses! I love them all. Hopefully I win and have to pick my favorite. This would be a fun dress to wear, I love it!!! Love them all, but especially the pebble on asphalt! Oh how I love a gorgeous knit dress! What a fabulous giveaway!! Wow so pretty! I love them all! It would be such a tough choice if I won! I love these dresses. 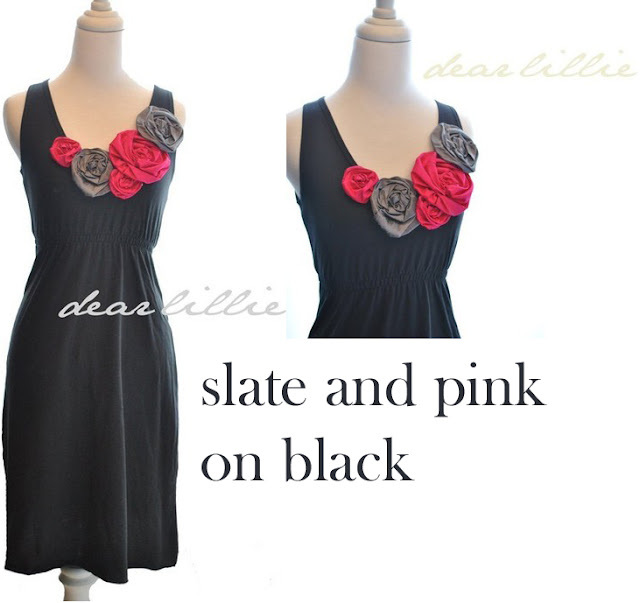 The pinkand slate on black dress would be great with pink shoes. The pebble on slate is my favorite. I also love the those cute tutus! I just adore these dresses!! Oh my - I love these dresses!! Oh my...waaay too much cuteness!! Those dresses are so adorable! I love the muted pink! So pretty... love pebble on asphalt! These are indeed beautiful! Thanks for the giveaway. Um, yes! Those dresses are awesome. I love the pebble on asphalt. P.S. loving the mother's day ideas!! Oh-dresses are my new favorite thing for summer! Love the slate and pink on black!! They're each so absolutely stunning! Beautiful dresses, what a great find! These are truly lovely. I would love to have one of these. I don't know what I would pick either. . .I would have to really think about that one. Thank you for the giveaway! I want the dress in EVERY color combo! It's beautiful! So Adorable! I want the slate on asphalt with pearl accents one! Oooooh, either fushia and slate on asphalt or the black on black. These are lovely. I am in love! How pretty! I'm not sure which one I would choose either...Ahh! My breath just caught. Amazing! That would be the absolute perfect thing for me to wear to my brother's wedding this summer!! Oh I hope I win! What an awesome giveaway! I'd love to win! I have been searching high and low for a dress for my rehersal dinner with large rosettes! This is perfect! The slate on asphalt with peral accents would just make the whole evening! So super cute! I love them all! So gorgeous, I would have trouble choosing just one! I would pick the black and pinks...or maybe black on black! LOVE them! The pink/black is my favorite by far! Those are so pretty! 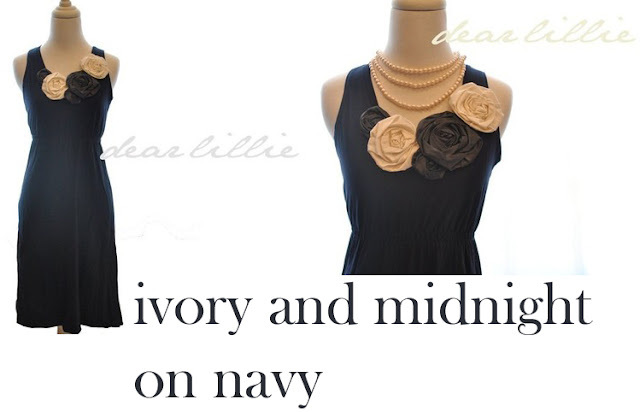 And they look comfy too..
Ivory & Midnight on Navy. What a beautiful simple dress! I have the perfect cardigan to go with! I agree! I love, love, love these dresses. Can I have one of each? But the slate on slate with pearl accents is just sticking in my mind. Gorgeous! I would love to have one of those dresses! would love to win !!!!! Oh, I keep looking through my closet convinced that there isn't enough that is beautiful and feminine in it. This dress would totally help fix that complaint - but a dark color because it looks good, or a light color because I have so many dark ones? LOVE all of them!! AMAZING! Cute! I like Ivory and midnight on navy, ivory on muted pink, or black on black! these dresses are so BEAUTIFUL! i think that pebble on asphalt and slate on asphalt are definately my favourites! 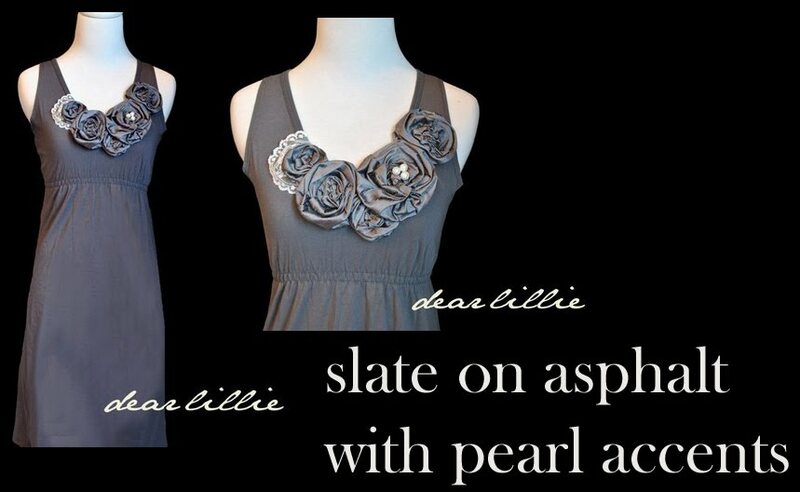 the pearls and lace on the slate are so sweet! i'd love to win this dress! Oh my goodness! Those are so great! What a perfect spring/summer dress to wear to the office, dinner dates, and shopping...so versatile! I love the slate on asphalt! What an awesome giveaway!! These are beautiful!! Love them all. Those dresses are amazing! It would make a perfect birthday dress for me! I love the ivory on muted pink! LOVE these dresses!!! 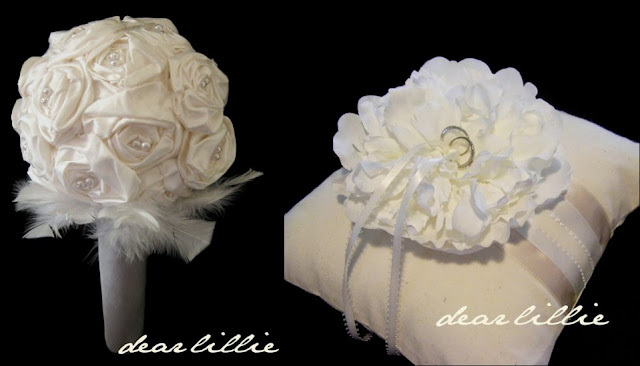 Think I would pick the one with the pearl accents! What a lovely shop...I had to heart it! Loving those tanks and dresses! they are so cute! And they look comfy! I want one! I love all the color combos! I can't pick just one! Beautiful dresses! I love the ivory and pink, so delicate. just started following your blog and it has inspired me to get back to crafting. Love the dresses! I could definitely use one for Mother's Day, so please pick me dear random integer picker! I just love those gorgeous dresses! Oh please pick me!!!!!!!!!!!! I would love a new dress! This would be perfect for my best friends wedding rehersal this summer!! Love, Love, Love the dresses!!! I love all those colors too, can't choose which one is my favorite! These dresses are beautiful! The black one is my fav! Too incredibly cute! I've run across these before - they're great! ::sigh:: the last new dress i got was a maternity dress.... 3 years ago. Ooooh! i have a major crush on those dresses!!!! ooohhhh! love the slate on asphalt or the black on black! I LOVE those dresses! So cute! 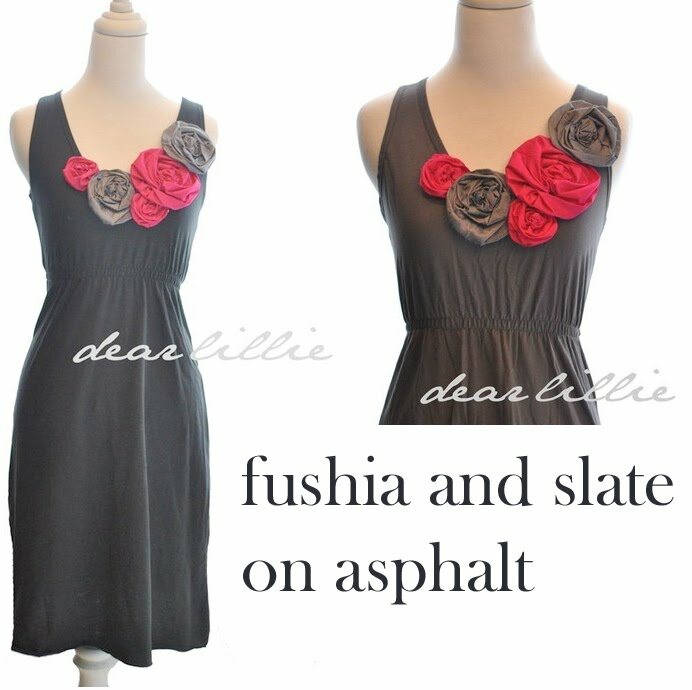 I think fuschia and slate on asphalt is my favorite but they are all cute. Oh, they are all so lovely but I think it would have to be the ivory and midnight on navy! Please can I have something nice, it's all been rather awful lately and something pretty would be a good cheer up prezzie! Wow, those are gorgeous. I would love to have one. Too cute! I love the flowers so much! Beautiful dresses! I was browsing their etsy shop after your last post that included the dress. I LOVE the slate & pink on black! Such cute dresses! please,please,please!! pick me!! I LOVE THIS DRESS!!!! I LOVE THESE DRESSES! i hope i win. So simple and chic, I love it! those are amazing!!! perfect for an upcoming wedding in Florida!! just my style. 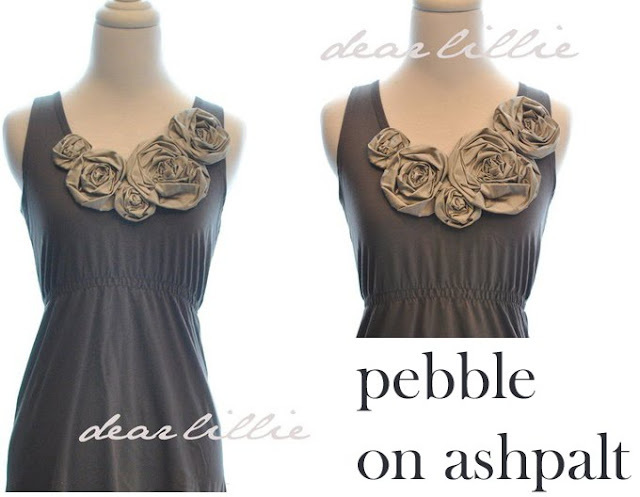 I love these dresses and dpent quite a while browsing their site after you posted a pic the other day! I love the ivory on pink, but pink isn't really my color, and I also love the slate on asphalt and think I'd pick that one! SO CUTE!!!!!!!!!!!!! Epic giveaway and epic blog!!!! I simply must have one of those dresses!!! So cute! I looooove the pink dress. Beautiful! I love "slate on asphalt"! What a wonderful giveaway! Such goregeous dresses! All of their things are stunning! I am praying I win. that dress is wonderfull! I would pick the slate and pink on black. Gorgeous! I LOVE the ivory on muted pink! Oh I'm crossing my fingers! These are BEAUTIFUl! Thank you so much for the opportunity!!! Wow the dresses are so lovely. If I win (fingers and toes crossed)I would have a hard time deciding which colour to pick! Oh I love your blog so much!!! 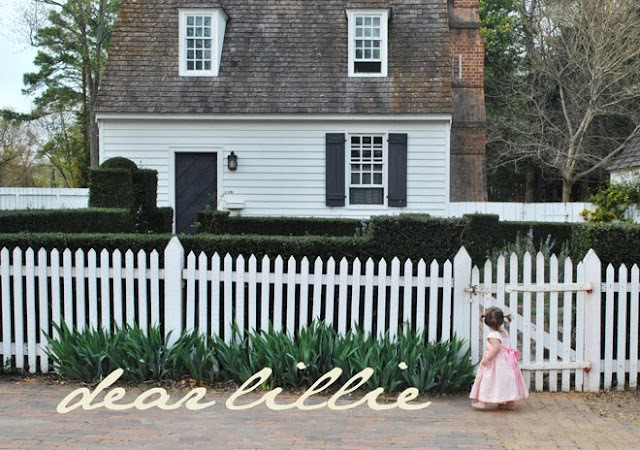 I love love LOVE those dresses but what I love even more is that my daughter's name is Adeline!!! I would love any dress!!! ooohhh slate on ashpalt for me please! love em! Slate with the pearl accents! Love them all though! I have been thinking about this dress since you posted an image of it last week! Oh my! Oh my! How beautiful!!! Someone is going to have a tough choice! Oh, my GORGEOUS!!! 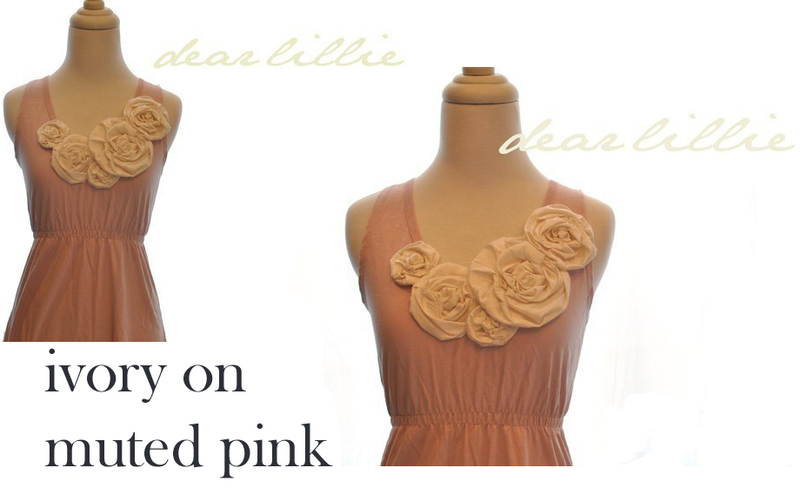 The ivory on muted pink is about the most beautiful thing ever!!! I LOVE this dress!!! Wow these are beautiful! Thank you! What a great shop! Thanks for introducing me to it Disney! I love these dresses! I want to learn how to make those flowers!